Grade 5 Cracked the Code! Mrs. Breda's Class Cracked the Code! 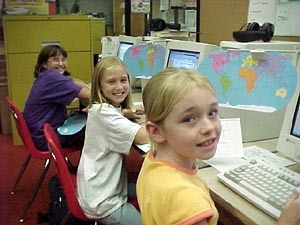 Fifth grade students in Mrs. Breda's Social Studies class came to the Write Place computer lab to "Crack the Code." 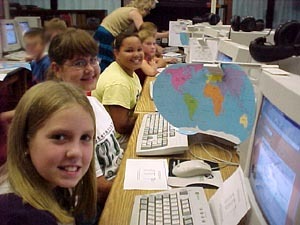 They visited a National Geographic Expedition website where the latitude/longitude activity is located. First letters from each place-name read. Spell out the town and come with speed. The scrap of paper also showed letters and numbers which are actually the latitude and longitude of cities around the world. By taking the first letter of the names of each of the cities the students identified the name of the city where the robbers have taken the maps. 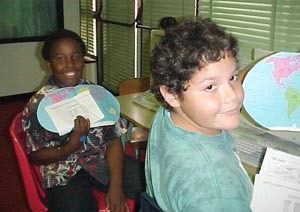 The first two students to "crack the code" were Nick and Phillip!